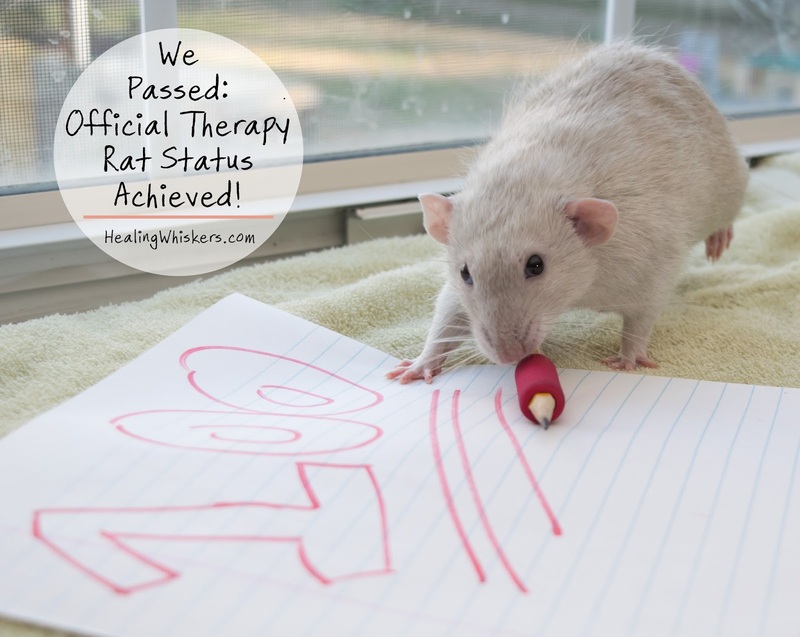 Healing Whiskers: We Passed: Official Therapy Rat Status Achieved! We Passed: Official Therapy Rat Status Achieved! Yes, that's right. Oliver and I are now an official Pet Partner team. 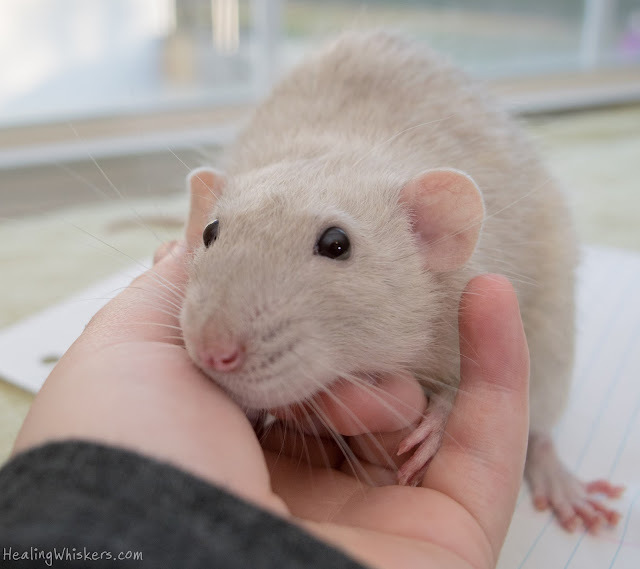 Oliver is a therapy rat! 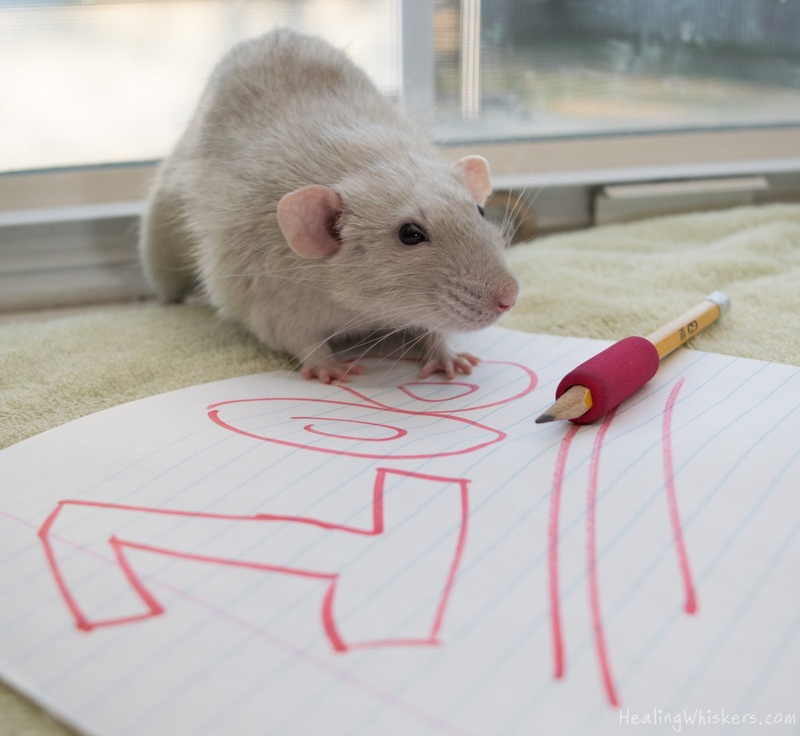 We need to write a detailed post all about what happens in the evaluation, but essentially it is a test which tests which sees how your rat reacts to stimuli such as loud and unusual noises, movement, and touching. Oliver and I are rated as a team and we both had things we still need to work on. There are a couple of different outcomes to your test: Complex, Predictable (optional special recommendations), Not Ready, and Not Appropriate for Visiting. I will go into all of those in a future blog post, but we scored a Predictable which is passing! We would have gotten Complex if a couple of things were done differently and thus would have been able to visit more advanced and stressful places such as airports, prisons, or mental health facilities. So what happened during our evaluation? Well first off, I was a bit nervous because we hadn't gone out in around a month due to the weather being chilly, so we were a bit rusty. Oliver did well meeting strangers and even leaned out of the basket which our evaluator enjoyed seeing. That can be taken as him sniffing people out and trying to "see" what's in front of him, (rats can't see very well at all and rely mostly on their nose) or him 'seeking engagement' from the people. Granted, Oliver's brother Jasper is very eager to meet new people compared to Oliver, so there is something to that. I think by the end of the evaluation Oliver had grown accustomed to the testers and wasn't so eager to sniff them over and that lost a point when it came to being surrounded by a crowd of people. He was like "Yes hello, ok I've met you before. Feel free to pet me while I snuggle in my basket". One of the biggest things to knowing when Oliver is stressed out. A lot of this is knowing your rat and even for me it is difficult. He does seem to get in a mood when he gets in the basket and excessive sleepiness when he is handled is something I look out for. Even with my past rats that was a sign of overstimulation. Bruxing is another sign (grinding of the teeth), but honestly I haven't seen him use bruxing as a sign of discomfort, just when he is enjoying himself. Again, another blog post in itself, but our evaluator was also learning these signs and as we went through the tests Oliver got sleepier and sleepier so he wasn't as active during the end. During our outings to events and such Oliver got many breaks. Most of these events I would stand in one place and someone would come up and pet him. When no one was there he got to nap in his basket so that was more of an ideal session, for him anyways. Crowds, reacting to distractions, passing the basket around, being around a dog, handling, being around someone on crutches, yelling, being bumped into, and being given a treat we did well at. Restraining hug was iffy and Oliver squeaked with that. I've had a rat who squeaked when you touched him (he was a wuss), but Oliver rarely ever does so he obviously really really did not like it and was trying to squirm away. I haven't really worked with that because I will not let someone squeeze him with a hug, but might be something to work on. Another part where Oliver is taken out of his basket and handled by the evaluator is something I messed up on. I wasn't clear on how to hold Oliver right or was a little late in doing so. I seemed to have a brain fart and forgot that I could correct and teach the person on how to handle him. I do this all the time when we are out, especially with children. I usually would put Oliver on a towel or blanket and then wrap him up a bit (this is for infection control and also even when I clip them, rat nails can be pokey) and then hand them over to the person. And that's it! I think after we have some actual therapy visits under our belt we will retake the evaluation and see if we can get a Complex rating. I'd love to achieve this with Oliver if possible, but he isn't Mr. Perfect and I might just be pushing too far with that. Otherwise, I am very proud of him! On top of everything, he didn't poop the whole time he was there, haha! Hard to believe the first time I met him he pooped ALL over me dubbing him "the poop monster". 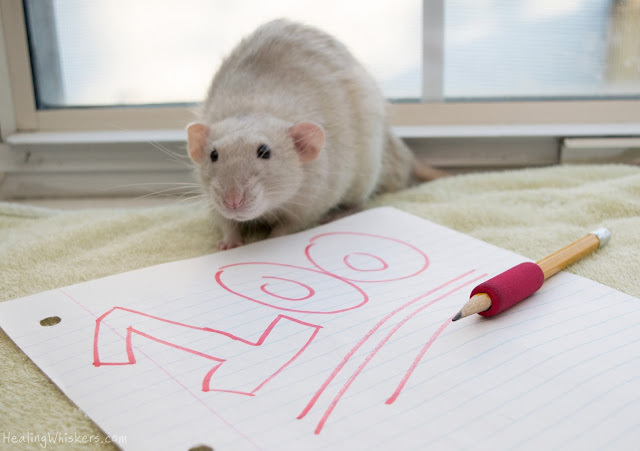 Stay tuned for more informative posts for those who are interested in training their own therapy rats! Leave a comment below congrRATulating Oliver! CongRATulations Oliver!! Youre so talented!! 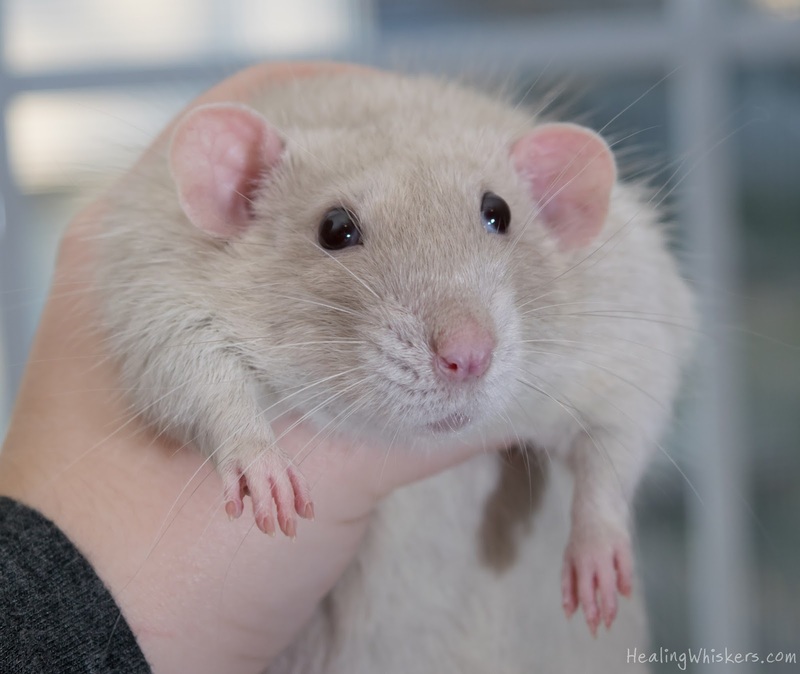 A therapy rat is something new to us. CongRATulations on Oliver passing the test. I'M SO HAPPY TO SEE THIS!!! Therapy pets are so important and I've always believed that rats would fit the role perfectly. Oliver you are the MAN! Congratulations on passing your therapy test along with your human partner. Hooray! I just passed with Herbie, my cat. I'm so excited about doing "Team" therapy. CongRATS! That is so exciting for you & Oliver! When did you decide you wanted Oliver be a therapy pet? 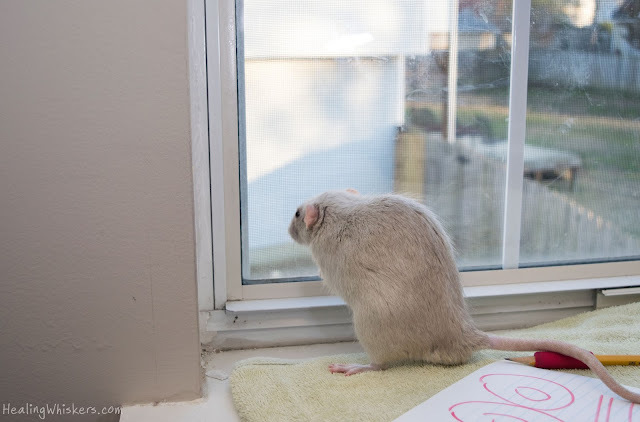 I never knew that there were therapy rats, until I learned about Oliver's blog back in March! So glad my flat self & Mom got to meet you both in purr-son in May at BlogPaws! What does Oliver think of kitties? Mew Mew!